Earthquake in Kolkata, Guwahati sends people scurrying out of buildings in panic. The epicenter of the earthquake in Myanmar according to USGS. 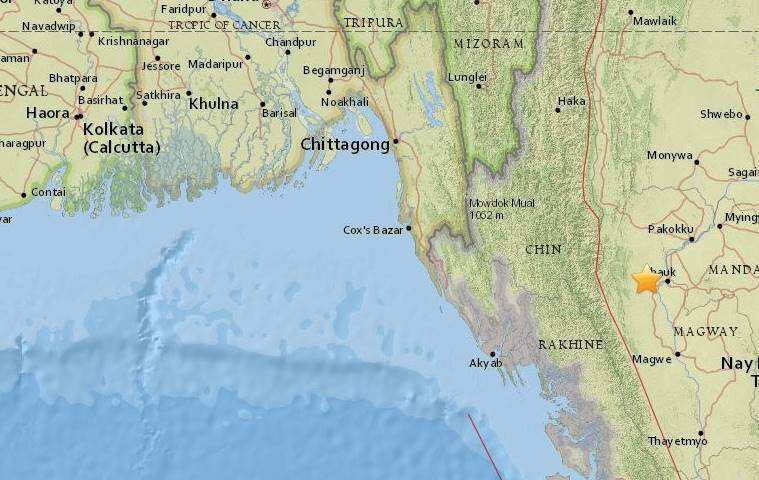 An earthquake of magnitude 6.8 on the Richter Scale hit Myanmar on Wednesday afternoon with tremors felt across east India. Reports of strong tremors have been felt across West Bengal and Assam. There are not reports of casualties yet. According to National Centre for Seismology, a unit of Ministry of Earth Sciences, the epicenter of the quake was in Myanmar and it occurred at 4:04 PM at a depth of 58 kms. People panicked and fled out of buildings in Kolkata, Patna and Guwahati. Metro services have been temporarily suspended in Kolkata after earthquake tremors were felt in the region. In fact, over the past week, there have been a spate of smaller earthquakes across the north east. The northeast is one of the most earthquake prone regions in the world. “Tremors were felt in Darjeeling and Siliguri in North Bengal, but there is nor report of casualty so far,” said District Magistrate of Darjeeling Anurag Shrivastava. He said the intensity of quake was low and he doesn’t expect any loss to property or life.